The fuss about having a small wedding and destination weddings are becoming more and more popular and spoken about. Let’s take a look at what all the fuss is about!! When you’re guaranteed great weather, incredible venues and combine all the loveliness of your wedding day with a sensational honeymoon experience it’s easy to see why more and more brides are choosing destination weddings. Read on to find advantages of having a small wedding and a destination wedding followed by a closer look at one wedding venue in Spain, Seville and tips on how to make it happen. I will also be showing around Seville a little, how can I resist showing you that! By having a small wedding you’ll be inviting your nearest and dearest. You won’t be having to begrudgingly invite guests who you really don’t care that much for. You’ll have a much more intimate experience by only inviting key friends and close family relatives. ZING it and tick all your boxes. Literally with smaller weddings you can spend more on your overall day. There are less guests to cater for and therefore you can really ramp it up and create a luxury event. Make it more about you as a couple and you can choose to weave your personalities and what makes you special throughout your event. You get to have a much larger budget for selecting luxury welcome bags, thank you gifts, favours and oh, did we mention the food??!! You get to include everything you’ve been dreaming about. Whether that’s a sensational contemporary gastronomy experience with an orchestra and harp player, to that flower dripped stage, fire performers, your dream photographer, your designer wedding dress and oh, oh, oh….your dream hand painted wedding invitations! You will definitely have the budget for some custom made painted wedding stationery to place throughout your event, think painted luxurious table numbers, bride and groom signs, stunning menus that make your tables a feast for the eyes! Small wedding venues not only cost less than the average city hotel, but you’ll also have way more choice. There are hundreds of large villas that are scattered through cities and the countryside. You have so much choice. Throughout the whole of Portugal, Spain and Italy, you’re really spoilt for choice. Whether it’s going for a villa amongst the rolling vineyards or a converted hotel. Perhaps you’d like to be in the midst of a historical city centre. If possible why not opt for an out of season date the prices will be more competitive too. Many of the locals that I spoke to in Portugal actually avoid getting married in the holiday season. They know that all the main hotels and venues bump up the prices sky-high. So they often choose to get married outside the busy summer months (and I’m sure this is a view shared throughout the Mediterranean). Family politics. I feel terrible in saying so, but we all know that there are people and friends we all have that we’d rather knock off the list. You certainly do not want to feel obligated to invite everyone. A small wedding and a destination wedding gives you exactly that option (for destination wedding etiquette see here). You’re whole family and plethora or friends simply won’t be able to all book tickets, hire cars and make it, so this is a great excuse to be selective and only invite those that truly matter. Big city weddings venues plus all the other expenses quickly mount up. A couple can fly off to an all inclusive resort including all the lodgings, meals and trimmings for a fraction of the price of a normal big city wedding that cost anywhere from around $20,000- $90,000. Take all the stress out of planning your wedding. With destination weddings, there are actually many wedding planners out there with all inclusive wedding packages. Including everything from handling your entire weddings décor, catering, flowers, sourcing the best vendors as well as handling all the legal bit and bobs. Be sure to contact these wedding planners for your small wedding. Work in advance so that you can vet out the best ones and check testimonials. I’ve found that when I check testimonials, often clients are embarrassed that I’ve contacted them. They and don’t want to answer any of my questions about the vendor, not a good sign! Old Friends. You’ve always wanted to have a reunion with old friends and family. But they’ve moved way out of town, heck some to the other countries. A small wedding is the perfect opportunity to get together. In Mediterranean and many other destinations in this region there are so many choices! With romantic wedding venues in Spain, Italy & Portugal that all have excellent weather pretty much all year round. Be sure to research this keeping in mind which months you’d like to visit. Some months are so incredibly hot, you need to keep that in mind and ask if your hotel has air conditioning, as smaller ones often don’t! Also, keep in mind that with the hot, hot weather, you need to pack suitable clothing and enough changes of clothes because, believe me from experience, once you have ventures out for some sightseeing, I sweat profusely (normally I hardly seat at all) and when I came home I dived STRAIGHT into the shower! Don’t forget to tell your bridal stylist about what type of weather you expect, so you don’t end up sweating through your dress on your big day and manage to buy a dress that will compliment the weather, maybe forget that enormous heavy veil and reams of puffy fabric??! From the moment you arrive at your destination, you are pretty much on a honeymoon. Make an extended weekend of it, or stay for a few days. Make this not only the wedding of your dreams but you have a chance here to make some incredible memories. Why not have your small wedding in Seville, Spain? 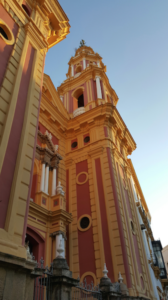 But First of All…….What’s Special About Seville……? 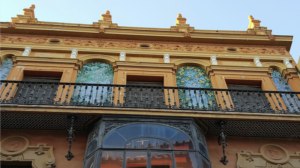 Let me take you on a tour of Seville and show you just what a spectacular gem of a city it is and how I am still besotted by this place. Can I go back please, hopefully if I ceaselessly beg my husband maybe he will take me back…(errhemm) ??? 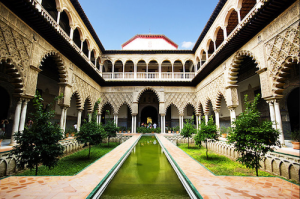 Seville is a stunning city, with a rich cultural background influenced by incredible Moorish and Roman styles. Of course, Spain is famous for flamenco dancing not to mention it’s cuisine. A few summers ago, we all hopped in the car and drove from Leiria in Portugal, down to Algarve and then across through to Spain and Seville. I just couldn’t get enough. The streets. The culture. It is hard to describe, but for me that city was like an eclectic mix of Rome, Sintra and Morocco with a pinch of Italy rolled on. Literally in the city centre, every single street was paved with stunningly high townhouses. They were regal. Colourful. a feature that stood out most was the fashion in the old quarter of those enormous castle doors that each town house seemed to have. My first question was, can we live here? The old quarter was my absolute favourite. BUT…taking a car through those tight streets is the hard part. Not too complicated, the hotel where we stayed did offer assistance on where we could park the car. Yet once we parked it, my husband was very reluctant to go and get it back out again. Most of the small streets are one way.It was parked pretty close to the hotel and we were wonderfully located in terms of sightseeing, of course we had to do some walking but it was not too bad. There are so many places to visit and things to do. My husband & I loved it thoroughly, and our teenage boys were happy to be left in the hotel with internet! Palaces, mansion, arts, antique interiors, wonderful food, these are all things we love and these things are all available at mass scale in this city. 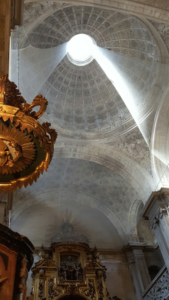 Visit the cathedrals – there are plenty! City tours, you can find many city tours and book them here. Andalusian horse show which can be booked ahead of time as a day trip from Seville to Jerez and Cadiz.Book in advance as these can book up in advance. 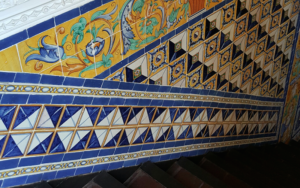 If you are a huge fan of mosaics, tiles, antiques and old relics passed down through generations, you really must visit the Museo Palacio de la Condesa de Lebrija. Evening tapas and Flamenco tour. We had the chance to visit Plaza de Espana, which we took a taxi out to. Very important, if you are visiting in the hot summer months, make sure you always have plenty of water with you at all times, in thermal flasks and believe me take the taxi! Some places are too far to walk and taxis are relatively affordable. 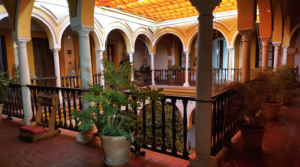 Let’s take a closer look at Hotel Casa Imperial. 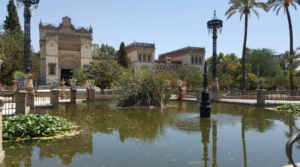 I recently visited Seville, Spain and stayed at The Casa Imperial Hotel. It was love at first sight and I knew straight away it was the perfect, romantic venue for a small wedding. The venue was like a hidden gem within the many winding paved back roads. From the first moments when I walked through the entrance with enormous castle like doors the hotel, which used to be a palace impressed me greatly. 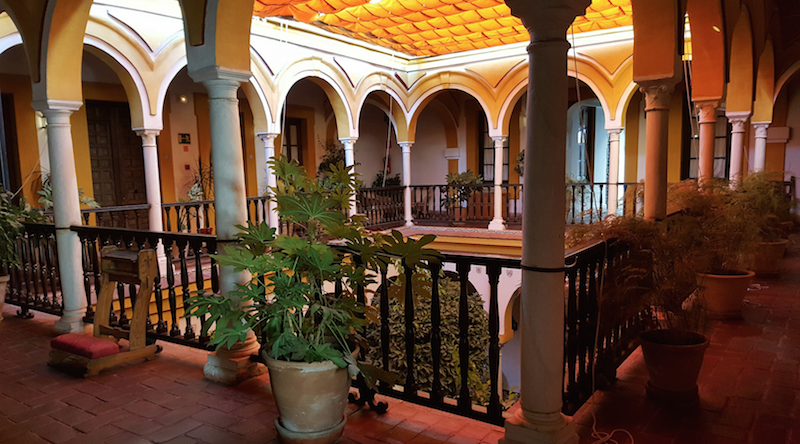 The 4- star Casa Imperial was a former palace built in 1530 which was renovated in 1994 and converted to a hotel. The property lies just five minutes walk to the shopping malls. Less than ten minutes walk to the cathedral and the Alcazar, the royal palace. The hotel features twenty six rooms each decorated in an unique style, but in keeping with the history and architecture. If your big on cultural diversity, history, antiques, hot weather, tropical plants and fountains and colourful tiles, this is your paradise for your small wedding. It has a perfect outdoor breakfast area that could be conveniently used as the perfect small wedding venue space. The hotel has a fairly good medium sized inside breakfast room which could be used by caterers to set up and manage the food and serve beverages/cocktails or even a luxurious Tapas inspired buffet. The hotel boasts many rooms that are on different floors and can be in completely different areas of the building. You should be able to have enough room for about 40-50 guests comfortably. Many rooms are so large that the hotel could work with you to bring in extra beds. Some rooms even though on polar opposites can actually link together through an adjoining door. There can be many steep stairs so you’ll need to think about who stays where in advance and ask the hotel for advice. Couples with young children and elders can stay on the ground floor. The hotel has many surprising treasures to wow your guests. 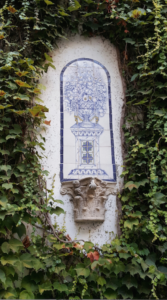 The walls are covered by a blanket of thick foliage, framing pretty tiled artwork. The stairs are truly magnificent and left me in a state of shock, as I have a love for tiles and the wide luxury wooden stairs where completely engulfed in a sea of spectacular, vibrant patterns. It has a inside courtyard of gardens, mini orange trees, perfectly preened hedges finished off with a romantic fountain in its centre . Around the edges in this courtyard oasis are comfortable seating areas with free wifi. The hotel has a parking lot that they will help navigate you too. It’s actually easier to get around Seville with a taxi which is pretty reasonable when you need to get from A to B. What were the details that made a lasting impression from this hotel? The ancient details- old Moorish details preserved and built into the walls. This small wedding paradise, is charmingly decorated. The whole hotel had that antique, regal feel. 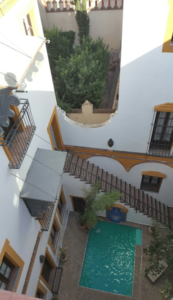 You literally felt as though you were living in an old palace in Seville and as you walked around you absorbed all the sights, uniquely decorated passages, the exceptionally tiled wide stairs, the little paddling area and most of all the peace and coolness of your own air conditioned room. 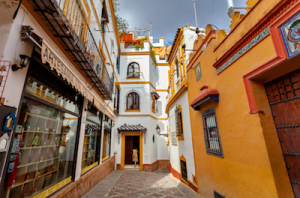 Seville is a city has a wealth of things to do, amazing affordable food to eat and an enormous array of places to visit. Your guests can go out for plenty of short walks, grab some ice-cream and eat it on the square nearby, in short, they will never get bored! Eating out. With Seville wedding packages, the restaurants are surprisingly affordable. Tapas is a super concept that I wish was introduced to all the restaurants in the world. Tapas allows you to order either a tiny taster amount, a medium amount of a large serving that could easily feed 3-4 people. As a family we chose 4-5 different tapas to taste the dishes before we ordered the main dish. The smallest Tapas is only 2-3 Euros. After eating about 4-5 of the smallest most utterly delicious tapas, we were surprisingly full! There are many ice-cream parlours with the tastiest authentic ice cream that is to die for in the hot summer months. 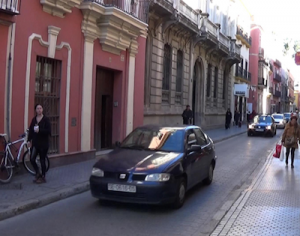 Seville has so many place to visit and the best form of transport is by taxi. It’s convenient, air conditioned ( it gets so hot!!!) and it’s very affordable for couples or families. A short hop will cost you about 4 Euros. We walked it one way and caught the taxi back. Places you must visit, there are plenty!!!! If you have a seville estate wedding during the holiday season make sure you get there early for an sightseeing, there will be a little queue otherwise. Casa de Murillo are all fantastic places to stop off, not to mention the world famous flamenco dancers. Destination Wedding Planners in Seville Spain. Here are some links to some wedding planners in Seville for you to contact and ask for wedding packages. Make sure you vet them carefully. Have a checklist, I will be writing one for destination weddings soon, but you can already find them on the internet for free. Ask for past clients that they’ve worked with, look at the photos of their previous weddings to get a feel for their work. Contact previous clients and check out the testimonials, approach them and ask them what they would have done differently and if there’s anything they could change if they could do it again. Ask for a video conference call and see if you click with your planner. Is he/she the one for you? Do their packages offer the whole shebang as well as covering legal issues and organising the ceremony? These wedding planners are in Seville. Wedding planners in Spain (not Seville). http://www.abruzzoitalywedding.com/ This companies wedding planner is called Alessia Odoardi, I have worked with her on a style shoot and I highly recommend her. She was highly competent and able to recommend a wealth of venues. Please share and comment on a destination wedding or a small wedding that you’ve planned, or had a nightmare with. Or perhaps you’ve visited Seville? A small wedding is always so intimate and enjoyable to the couples. There is no reception hassle and all other big weddings stress in the small wedding. The couple can enjoy their wedding more with their nearest family members and friends. Also, they can reduce their wedding cost. Thanks for sharing this useful post.